LAVCO is a manufacturing and metalmechanical services company founded in 1991 from a former company with more than 40 years of experience in industrial and automotive production and repair. Industrias LAVCO is an ISO 9001: 2015 certified company (Icontec Registry 1038-1). We produce and sell centrifuged gray cast iron liners for the vast majority of diesel and gasoline vehicles. We also produce in the industrial line, centrifuged cylinder liners for industrial stationary engines, reciprocating compressors and pumps in a wide variety of ranges; We also provide the repair service of reciprocating compressor cylinders. Thanks to our own foundry plant, we manufacture gray and aluminum pistons, cast bronze parts, nodular iron, molded parts such as gratings and grills for industrial plants and we repair parts for industrial equipment. Casting plant: We cast Gray iron, Nodular iron, Aluminum and Bronze. Machining Plant: We have C.N.C. technology for machining automotive and industrial parts. Production capacity of Centrifuged Cylinder Liners: we produce cylinder liners in measurement ranges from 25 millimeters to 50 centimeters in internal diameter and up to 1.25 meters in length. We have great capacity for the development of special products, without limitations of size or specification. Industrial repairs: We make repairs of multi-stage reciprocating compressor cylinders, for which we also manufacture the respective liners, pistons and more parts if required. We manufacture and rebuild parts related to the performance of compression equipment. We have more than 2,000 square meters of modern construction surrounded by nature where our foundry, machining and administrative offices work, and we count on the development of our company with an expert team of 100 highly trained people. Our market is made up of Colombian and foreign companies that sell engine parts, engine rectification workshops and operating and maintenance organizations in the industrial, oil and energy sectors, oil palm and food industries, among other sectors. Since 1992 we are the main Colombian exporter of our products destined to more than 13 countries in the Andean Community, Center and North America and the Caribbean, being our main destination The United States of America. LAVCO considers it vital to achieve sustainable growth in the long term and, at the same time, to leave a positive mark on society and the environment; This implies the realization of efforts so that, on the one hand, the human resource that makes part of the company and its families, are increasingly prosperous and also, that the environment benefits from good practices developed continuously by the company. To account for this, LAVCO presents the reports in which it states the progress and challenges of the 10 universal principles enshrined in the United Nations Global Compact, an initiative we have adhered to since 2011 (reports available only in spanish). To explain the level of importance of the concept of sustainability for LAVCO, it is important to mention that the main raw material used by our company is automotive scrap, accounting for about 80% of the total raw materials consumed. 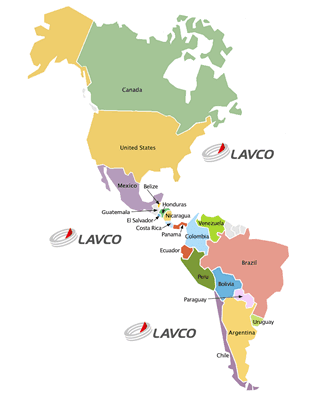 This is the central point of the policy of sustainability of LAVCO, because according to it, the company does not use any new natural resources for its production processes; on the contrary, it uses resources that were already consumed in the first instance in factories of cars and engines of the world. Therefore, both LAVCO’s products and its repair services for engines and compressors, represent a net activity of recycling and reuse of natural resources. In line with the above, LAVCO also develops another important number of activities that are part of its sustainability policy in the framework of its processes. As mentioned previously, the main raw material is automotive scrap, which is recycled and reused for the production of the products that LAVCO sells. At present, there is also equipment that reuses metal fillings and saves the company a significant percentage in the purchase of raw materials and contributes to a better environmental management of that by-product. It is melted in a cupola furnace, whose fuel is coke coal for which we maintain all the permits required by the environmental authority. Migration to cleaner technologies in the medium term is not ruled out, but while that happens, we work responsibly on environmental issues. It is machined with conventional and CNC lathes as well as other machines and tools. The technology has been migrating towards equipment more efficient in its operation and in electricity consumption. There is an organized work plan that covers all the legal and work environment approaches in order to comply with the demanding legal requirements. At present, the Supply and Logistics management has been incorporating the various aspects related to Occupational Safety and Health. Metal filings, charcoal and slag are generated. The metallic filing has been used almost in its entirety. The rest, through the management of BORSI (Bolsa de Productos y Sub-Residuos Industriales) is marketed to companies of casting or transformation that give a new use to this generated waste. Slag and charcoal are not toxic products, and Pontificia Bolivariana and Santander Industrial Universities are working on the identification through innovation projects, and other alternative uses to take advantage of them. Other wastes generated that do not correspond to by-products, are managed by organizations of recyclers: paper, plastic, used industrial oils, used cooking oils, etc. Organic waste is used in the manufacture of fertilizers by composting. The cylinder liners, being a metallic element, can be incorporated as automotive scrap again in the productive cycles of the steel industry. In addition, vehicle engines, compressors, etc. that receive our products through the service of cladding, receive a new life cycle comparable to having a completely new product. Efficient use of energy: Priority is given to the use of natural lighting. The types of engines used to avoid wastage are reviewed and calculated. Gas is an important source of energy for the smelter, and reasonable use, permanent maintenance and leakage control are also sought. Recycling: We manage serious policies for organized and systematic recycling. It participates actively in the Post-consumption Days, led by ANDI, from which responsible final disposition is given to different types of waste. We have alliances with companies dedicated to the recycling of: paper, used edible vegetable oil, burned industrial oil and with them, this type of waste is handled in a responsible manner. Likewise, induction is given from the hiring, to all the personnel in that sense. 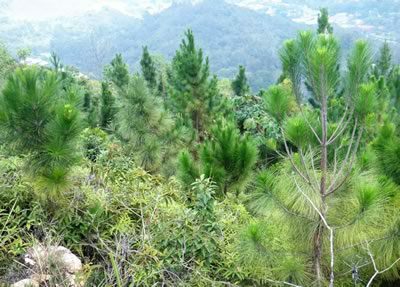 Reforestation: A forest of about 40,000 different trees planted is maintained throughout the year. 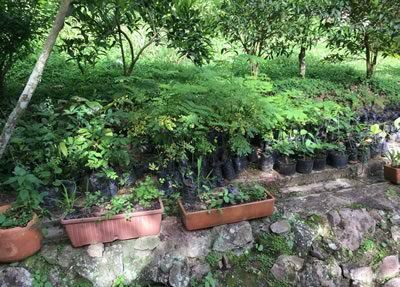 In addition, the company is located and maintained surrounded by nature, with green areas maintained appropriately throughout the year. Water care: Three (3) water births have been preserved throughout the year. The company has fixed natural sources of water duly registered with the environmental authority, complying with all the required regulations. Legal Aspects: The permits required by the environmental authority are processed and renewed periodically. Environmental management is an aspect that has been incorporated into the Purchasing Policy to be taken into account in the evaluation of suppliers and purchase decisions together with those of Health and Safety at work. We engage our suppliers in environmental issues, especially those who work in our facilities such as surveillance, cleaning and various services and cafeteria. The waste generated by the preparation of food (about 1 Ton per month, are used in the manufacture of compost by composting and use of red California worm. 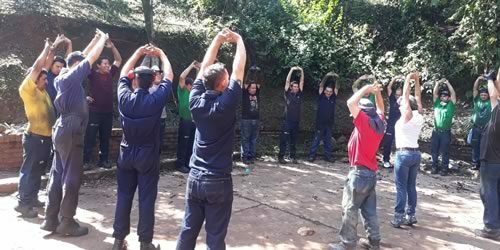 Within the framework of environmental management, the preventive approach predominates, as well as the search to increase the levels of awareness of workers and suppliers on this sensitive topic. In addition to complying with all the requirements of the law for work and offering a decent and well-paid job, employment is generated without distinction of age, gender, religion, or condition and even disability status, generating a responsible and worthy work space. In the case of mothers who are heads of families and, in general, mothers with children under the age of 13, flexible working conditions are offered. In the interest of complying with the 10 principles of the United Nations Global Compact, below are some of the activities that LAVCO has been developing on the 4 fronts that group them: Human rights, Labour, Environment and Anti-corruption. 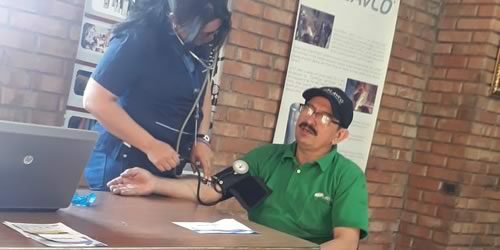 The company has begun the systematic evaluation of the level of respect for the human rights of workers, demanding strict compliance parameters from the entire body of coordinators. We have the Coexistence Committee, duly constituted, which also promotes concrete actions in this regard. We are initiating concrete actions towards our suppliers, involving them in this matter. The company does not contemplate the hiring of minors in any of its productive activities. We have incorporated this labor standard in the linkage and evaluation of suppliers. Within the categories of products and services, those that are most susceptible to this problem have been identified, finding the highest risk in the supply of coal. Therefore, it has been verified and committed to our suppliers of this item, as well as to the sand suppliers, so that they guarantee their commitment to it. Our company is small enough so that the Management can monitor and guarantee that no contract of this type is made. LAVCO has promoted work for people with some level of disability, provided they have the basic skills to develop a specific trade. This is how we currently have 2 people with hearing disabilities, one in the foundry area and another in the area of ​​machining who has just been pensioned. In our company there are also no age or gender restrictions for any position, except those whose very nature implies some specific physical condition to be executed. This also means that for the different vacancies within the company, women and men are hired under equal conditions. In the case of workers who have accompanied us for several years, they remain hired even when they are about to retire, even in the case of some who perform physical tasks who, despite not being able to perform them properly, remain in the company until they manage to achieve their pension. LAVCO maintains a policy of total openness to the hiring of people of all ages, from very young without work experience, to people over 50 years old, who are placed in positions according to their age, experience and competence. LAVCO maintains total openness in all positions, to give job opportunities to women. Women are hired in jobs that they are able to perform in both operational and administrative positions, granting them equal pay with respect to men. Flexible conditions are granted for mothers, especially heads of households. Special workdays are granted for those employees, whose tasks have flexible hours, allowing them to study. Through this benefit we currently have more than 20 workers in technical, technological and university studies currently. 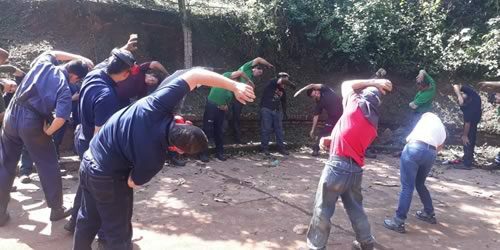 LAVCO is part of the 10M group with which, the ACR (Colombian Agency for Reintegration) created in 2014 the project: “Soldadores de Paz” supporting reinserted people, who were supported with the development of a training according to the needs of the private sector and providing them with opportunities to practice as SENA Apprentices. We are open to participate in similar exercises that in the post-conflict period that Colombia is going through will surely emerge. The SENA apprentice quota is respected according to the Law, but in addition, students are kept in practice and for degree projects of different faculties and universities of the region, allowing them to execute in LAVCO, the activities that their academic commitments demand, with a high level of accompaniment, requirement and collaboration. Likewise, students of technical colleges in the SENA agreement are admitted for the same purposes. Financing opportunities have been negotiated with financial providers for our workers, seeking the cessation of their extra-banking loans, and investing in personal projects, or solving past financial problems that left them without access to this opportunity. LAVCO has been promoting that its workers apply to the decent housing programs offered by the national government, achieving that in the last period, more than 12 AFC accounts have been opened for programmed savings and 4 workers will be able to receive their housing and the current subsidies for this matter. -Induction to workers on the environmental management of the company. -Use of appropriate containers for recycling that is permanently done. -Delivery of hazardous waste and all the ordinary ones that we can select and classify to expert operators in the handling and reuse of them. The gas heating system has been maintained for the Casting section, which saves 6 tons of raw materials per month and increases the quality and productivity of that section. 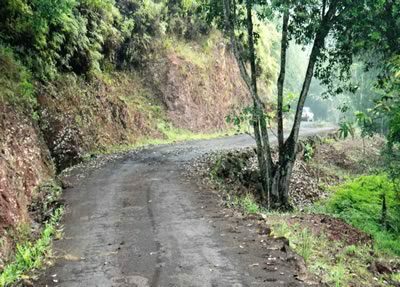 Through the Santa Rosa farm, adjacent to the company, a permanent forest plan is maintained to take care of more than forty thousand trees of various species and three water births duly registered with the environmental authority. 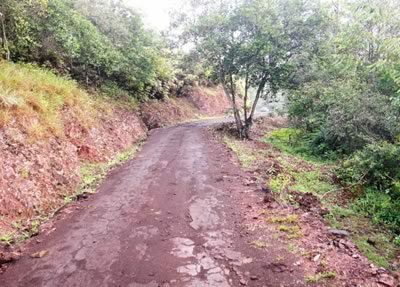 The company ensures the care of the edge of the Quebrada Menzuly in its journey through the back of the company, verifying that waste, garbage, etc. are not thrown into it. The company remains surrounded by nature in the middle of well-maintained gardens. LAVCO participated in all the post-consumer days that the National Association of Industrialists (ANDI) organizes periodically. In addition, the company was linked to the Carbon Footprint Measurement: a pioneering exercise in the country that was carried out within the framework of the Energy Efficiency Program of the Mining and Energy Planning Unit – UPME and the United Nations Organization for Industrial Development – UNIDO, and ANDI. It was made between May 2015 and June 2016. Although it is in the interest of LAVCO to participate in a Water Footprint Measurement Program, it was not possible to achieve it, mainly due to its cost, in the most recent Program promoted by the National Center for Cleaner Production and Environmental Technologies in association with Quantis and ANDI. Energy efficiency: LAVCO is registered in the EEI Colombia Program for the promotion of energy efficiency in Colombian industry, which is a joint initiative of UPME, UNIDO and ANDI whose objective is to strengthen the country’s technical and technological capabilities. A LAVCO engineer has initiated a diploma in the subject and enormous benefits are expected for the company. UNIDO Project: LAVCO is registered to participate in the Sustainable and Inclusive Industrial Development Program of the Automotive Supply Chain through the improvement of the Quality and Productivity of the UNIDO. LAVCO is managed with strict adherence to business ethics. It is strictly forbidden to venture into businesses where there is a direct or indirect need to handle bribes or any other type of dishonest act. Our participation in bids and calls is totally limited to the honest exercise of our work and not to request or give perks outside of the Law. Participate in the personnel selection processes that we carry out in LAVCO and in which we look for highly competitive and ethical people, who work as a team and have a deep sense of social responsibility.